Communicating with a large number of students and staff can be a difficult task. With the use of Digital Information Boards, either in a single location at your School or across a whole Campus, your message can now be updated with ease. 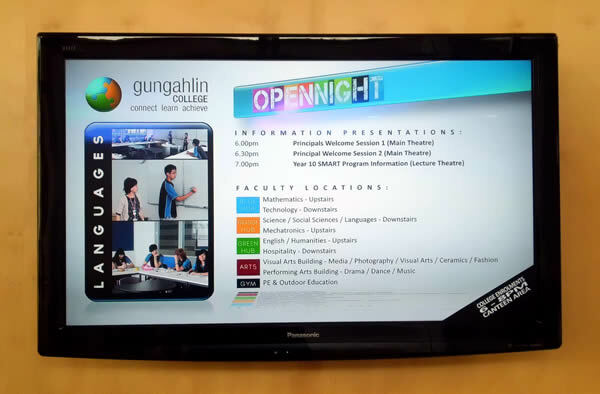 University, Colleges and TAFE - as a complete solution for Information Displays, Directional Signs, Meeting Information, Room Entry Displays, Digital Menu Boards and Wayfinding Displays for large campses.. The foyer entry signs are an ideal way of displaying information to visitors at the school. Usually located in the administration area, the screens can display school information and successes, P&C meeting information, student artworks and many other types of information suitable for visitors and parents to see. Whether located in the Staff Rooms, Library or General areas, these LCDs are the ideal Digital Noticeboard, displaying information to Staff, Students and Visitors to keep them informed of all school events and general Staff information. The Navori digital signage software system supports a large range of media files and has built-in user controls to limit who accesses what screens, down to what area of a screen the user has permission to update. These secure displays allow you to install your information screen outdoors. The LCD range in sizes from 32" to 64" and are sunlight readable. The LED displays are very effective as a single scrolling line. An LED placed outside the school is an ideal way of communicating with Students and Parents. The information can be updated and then sent to the large LED displays. Available as a single colour or in full colour. Affordable, entry level Digital Signage to fully managed corporate solutions. Remote Management, Multiple Display Zones, News Ticker.